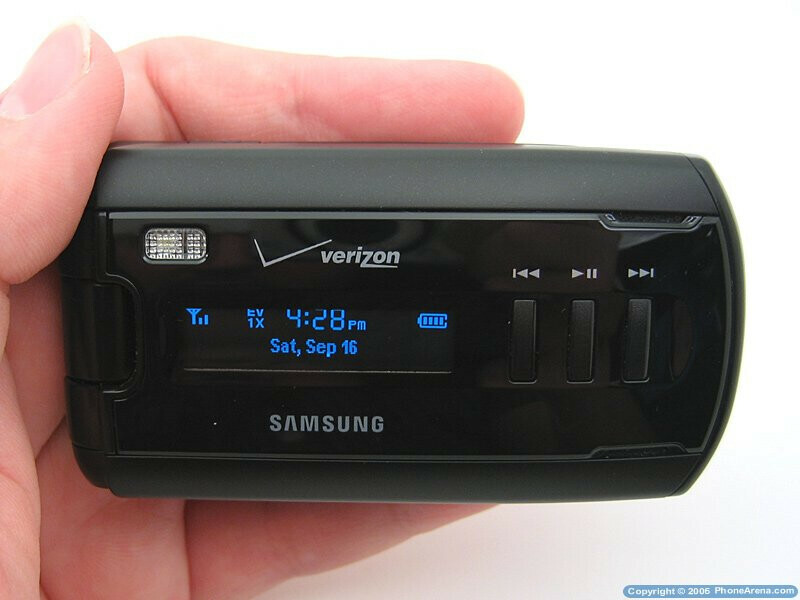 The Samsung A930 for Verizon Wireless is a sleek, all-black phone with features that position it between the A870 and A990, such as a 65K color internal display, blue OLED external display, 1.3MP camera, MicroSD slot, Bluetooth, and music player capabilities. The A930 supports EVDO for faster downloads and is Digital-only, which means it will not work in Analog-only areas. 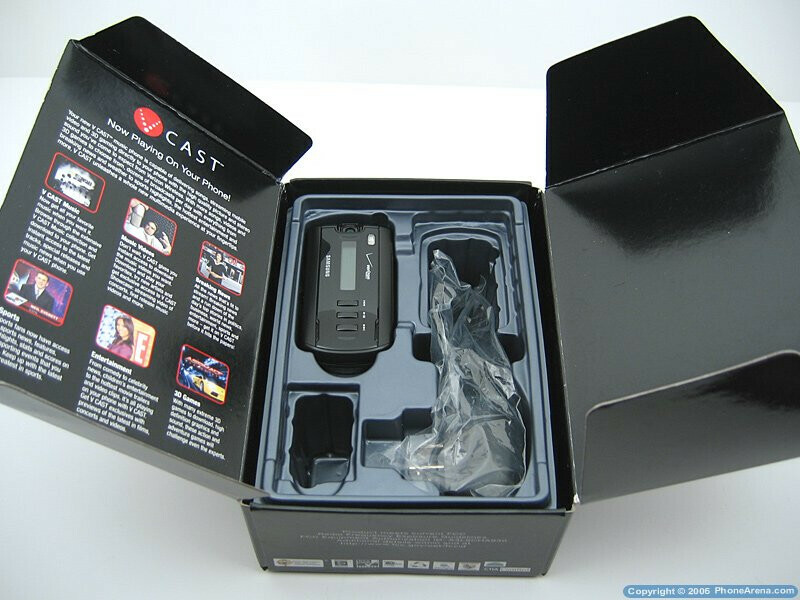 Included in the Retail Package is the A930 phone, standard 1000mAh battery with cover, wall charger, and user manual. 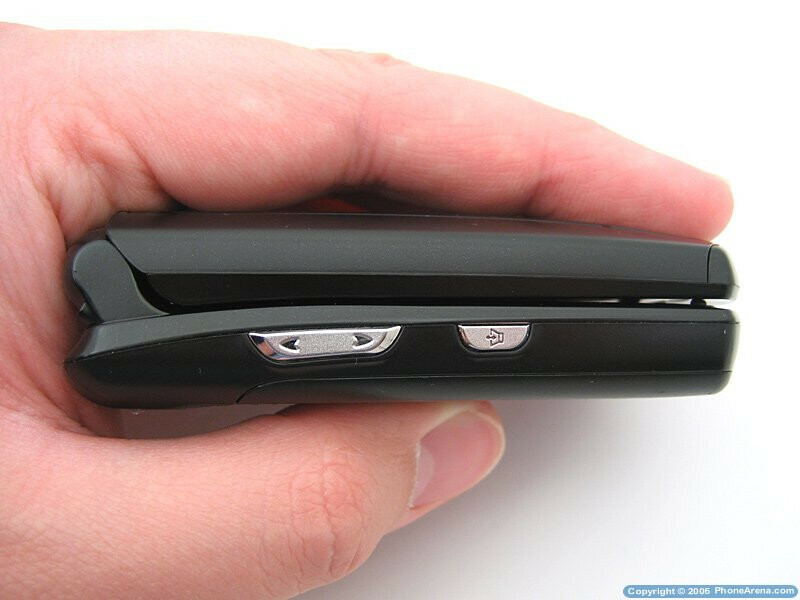 The A930 is an average sized flip phone, weighing only 3.98oz and measuring 3.59H x 1.89W x .98D with an internal antenna. 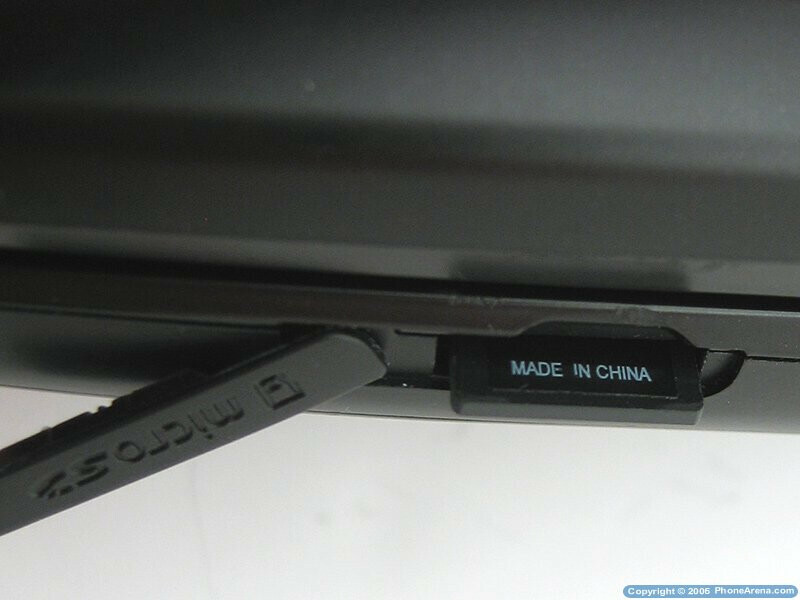 The body of the A930 is black with shiny plastic used around the external OLED display and Music Player buttons. The phone is constructed well, feels solid in the hand, and should hold-up with normal daily use. The flip works well and is easy to open and close without any creaking noises. The blue OLED display is 176x16 pixels and shows the signal strength, time, battery level, message alerts, and song information. The advantage of OLED is that it is easy to read in a variety of lighting, unlike TFT that is washed-out when viewed in direct sunlight. 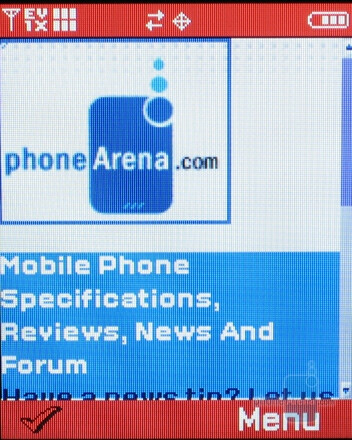 One thing that we did not like about the display was that you have to turn the phone horizontally to be able to read it. To the right are the Music Player control buttons for Rewind/SkipBack, Play/Pause, and Fast-Forward/SkipAhead. On the left side of the phone are the Volume Up/Down and Speakerphone buttons. 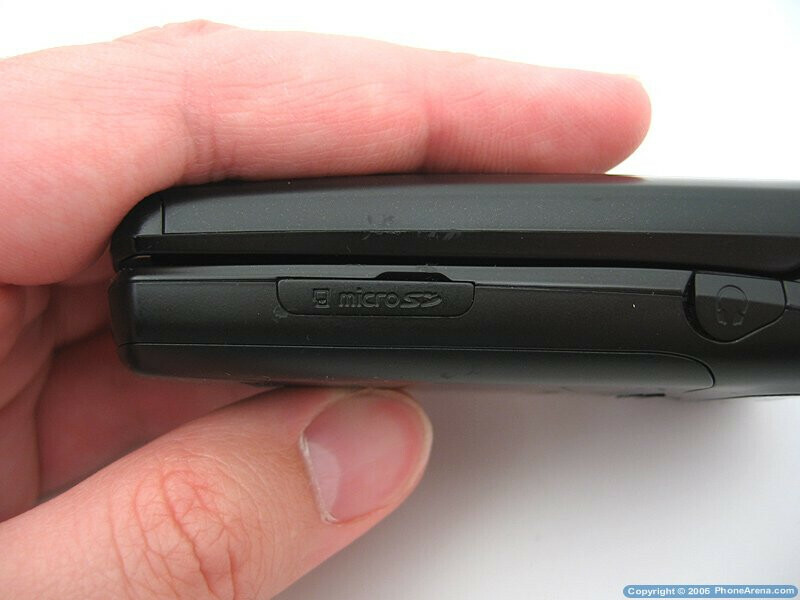 The MicroSD slot and 2.5mm Headset jack are on the right side, with the Charger/Data Port on the bottom. Opening the phone shows off the internal 176x220 pixel 262K Color TFT Display. This display type is standard issue on most phones because it has good resolution and shows images in full color, high contrast, and with vivid color saturation. Despite how good the display is, and with the brightness turn up to the highest level, images were somewhat washed-out when viewed in direct sunlight, but using your hand to shade the display will allow you to view it more easily. The numeric keypad has easy to read white numbers and letters, which are also backlit. Text messaging is not a problem because the keys are large, well spaced, and have a good response time, even though there is a slippery feel to them. 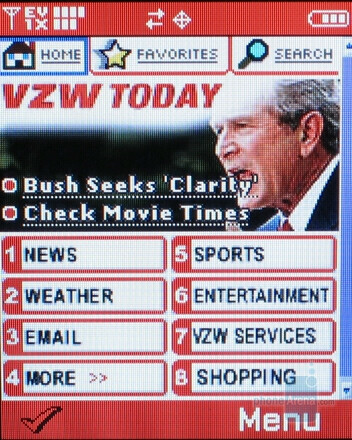 At the top is the circular 5-way navigational pad, which is clear plastic and shows metallic silver underneath it with icons allowing access to the Main Menu, Mobile Web, Get-it-Now, Pix & Flix, and the Calendar. We found using the A930's navigational pad easier to use than the A990, due to the larger raised OK button in the center. Pressing the center OK button will access the Main Menu options for Get it Now, Messaging, Contacts, Recent Calls, and Settings & Tools. Menu customization is lacking and is limited to only six color selections. Up to 500 contacts and 98 speed-dials can be stored with home, work, fax, E-mail, and cell numbers. You can also assign each contacted a picture and specific ringtone. 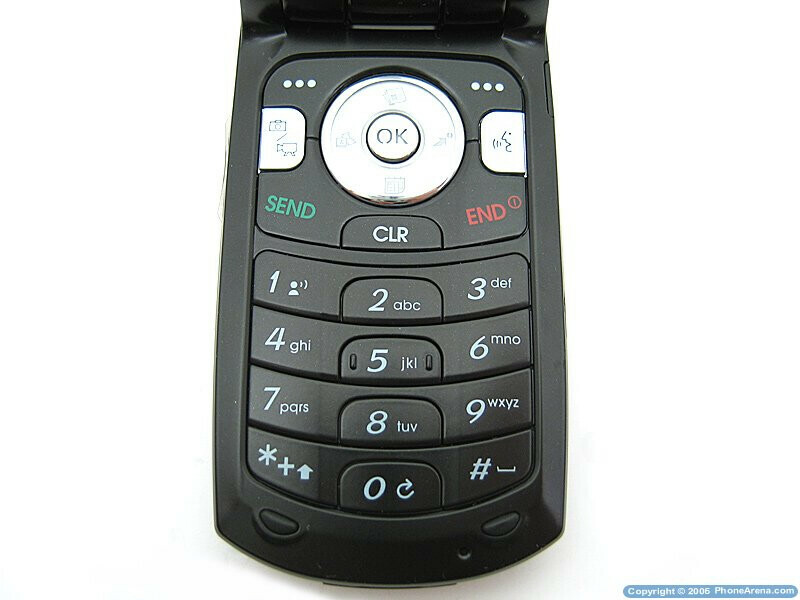 When that person calls, the image will be displayed on the internal display and the phone will play the ringtone that was assigned to them. Text, Picture, and Video messages can be sent to other phones and E-Mail addresses. We found the Speakerphone and VoiceCommand to be very useful. It sounds good as long as the volume is not turned up to the highest setting. This causes too much distortion in the stereo speakers and makes it hard to understand the caller. Voice Command allows you to tell the phone to call a specific person in your contact list or speak the digits for it to dial. Voice recognition accuracy was high, but was diminished when in noisy environments or when driving in a car with the windows down. Other VoiceCommand functions allow you to check the phones status, send text and picture messages, and lookup contacts. Bluetooth 1.1 is supported with up to 20 pairings. When a BT Headset is paired, the A930 will link it to the VoiceCommand Feature. Testing the A930 with our Jabra 250v had good voice quality up to 23 feet. Any farther and static could be heard on both ends. The Calendar allows you to enter multiple events for each day, which is an easy way to be reminded of important tasks and appointments. There are also three alarms that can be used separate from the calendar. The A930 only has 32MB of internal memory, so we recommend using a MicroSD card for storing pictures, videos, and music. 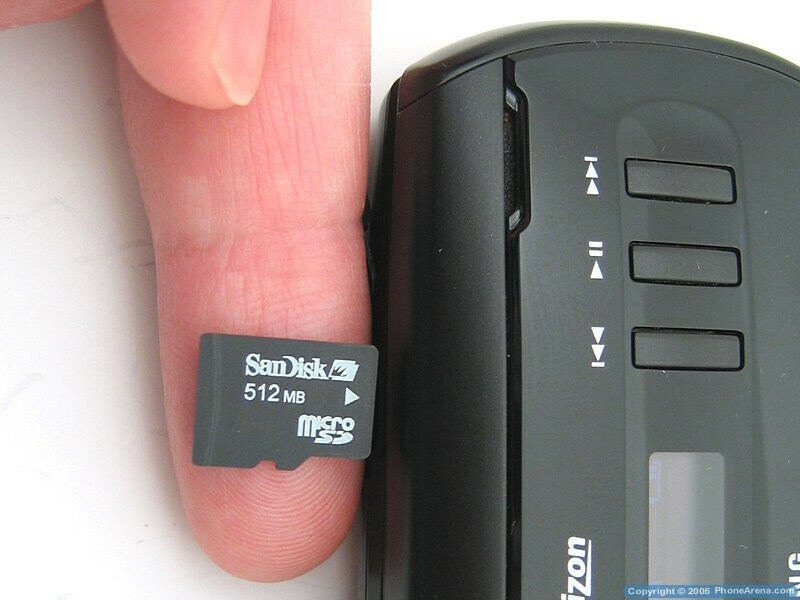 A MicroSD card makes the phone more usable since it allows more information to be stored. The A930 does not natively support MP3 playback. This can only be done by going into secret service menus that the average user will not mess with. That is why you have to use WMA. After WMA music files are transferred from your computer to the MicroSD card, insert the card into the phone. You can then access the files by going to the Manage Music menu and selecting the Artist and Album. 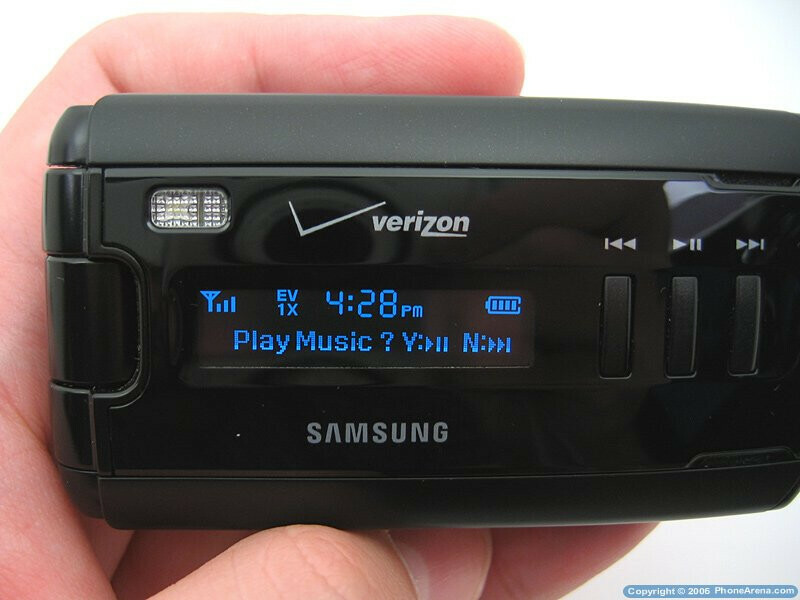 Once the song begins to play, you can close the phone and the OLED will display the song information. Pressing either the Rew or FF buttons will show a slider bar on the OLED and the current position of the song. Music playback sounds good because of the Stereo Speakers that are built into the phone, but music is louder on the A990. While the music is playing, there is no way to use the other functions of the phone (such as sending a txt message), which is something the LG Chocolate can do. 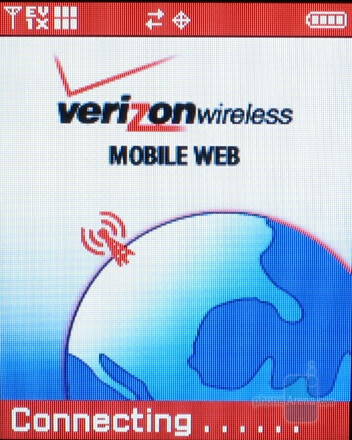 A basic WAP 2.0 browser is included and will connect to Verizon's Mobile Web service, providing information regarding News, Sports, and Weather. Download speeds are faster when in an EVDO coverage area, allowing WAP pages to download in under 2 seconds, compared to 8 seconds when using 1x networks. Using the WAP browser to view complicated HTML sites is not recommended, are problematic, and do not format properly. The A930 uses a standard 1.3MP CMOS Camera that is ingeniously built into the hinge of the phone. This allows the camera to rotate 180 degrees so that you can see yourself in the Internal Display when taking self-portraits. 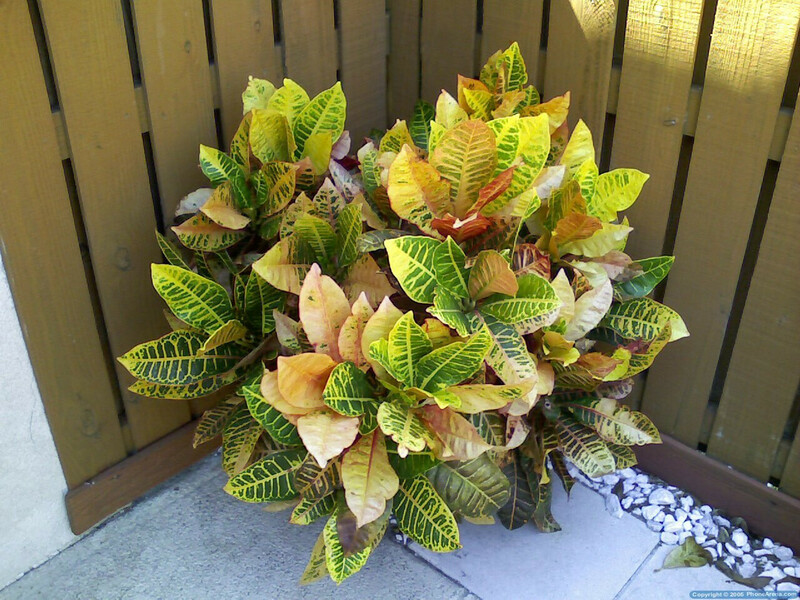 Pictures taken outside in the sun are bright with good color saturation, but edges are soft. Indoor pictures also look good if there is plenty of light available. There is a built in flash, which will turn on automatically when in low light, but the effective range is limited to only 2-3 feet. It is no surprise that photos taken with the A930 do not come close to the A990's 3.2MP camera, but they are still good quality for causal picture taking. Flash: Off, Always On, Auto, On this shot. Self Timer: Off, 2 sec, 5 sec, 10 sec. Multi Shot: Series Shot, Divided Shot, Auto/Manual. Resolution: 1280x960, 640x480, 320x240, 160x120, Picture ID. 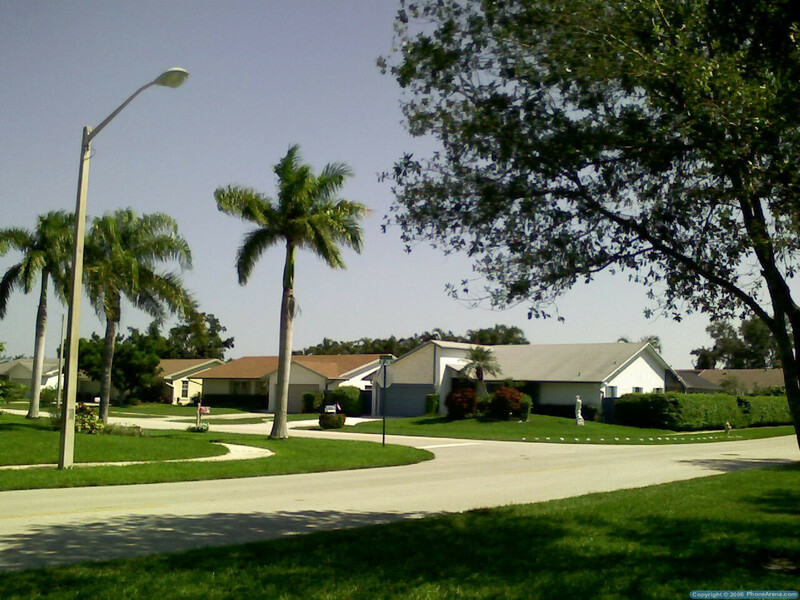 White Balance: Auto, Sunny, Cloudy, Tungsten, Florescent, Manual. Color Effects: Normal, B&W, Sepia, Antique, Negative, Green, Aqua, Cool, Warm, Sketch. Memory: Save to Phone, Card. Icon Display: Display All, Partial, Guideline, No Icons. Shutter Sound: Off, Shutter, Ok, Ding Dong. 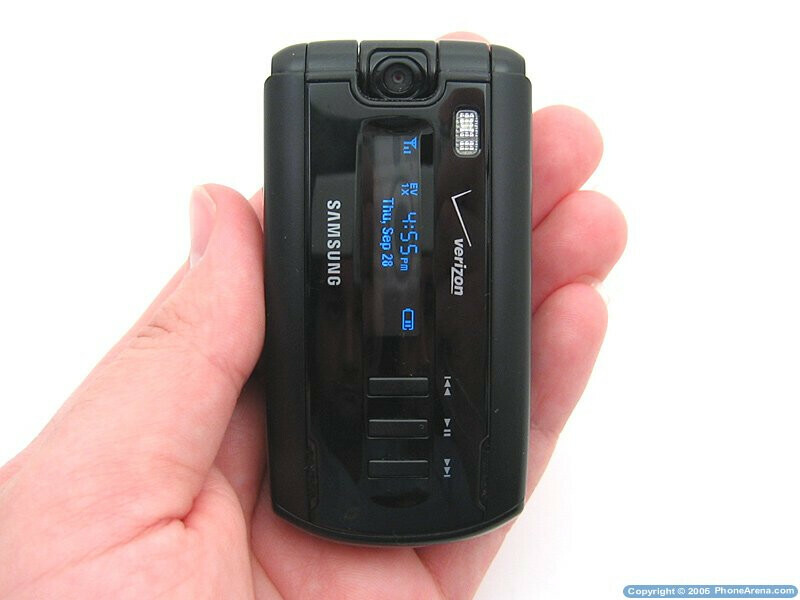 The Camcorder feature can record 15 second video clips with sound to send as messages to other phones and E-Mail addresses, or you can record longer clips when used with a MicroSD card. Most of the Camera Options are also available for shooting videos. However, video resolution is limited to only 176x144, which causes playback on a computer to not look good, so you will not be recording any Oscar® winning films with it. Voice and Call Quality on the Samsung A930 was equal with most other LG brand phones (such as the VX8300 and Chocolate), and did not sound as bad as the Samsung A870, but not as good as the Samsung A990. Calls made to people on a landline phone had good voice quality as well as calls to other Verizon phones. Voices were clear and easy to hear with no static or interference. Volume setting of Medium or Medium-High was loud enough for most environments, with the High setting only to be needed in much louder areas. Reception was also good, as long as we did not travel into fringe areas where signals are spotty. Even though the A930 and A990 have an internal antenna, the A930's voice quality was not as good as the A990 and the A990 could pick up more reception in fringe areas. 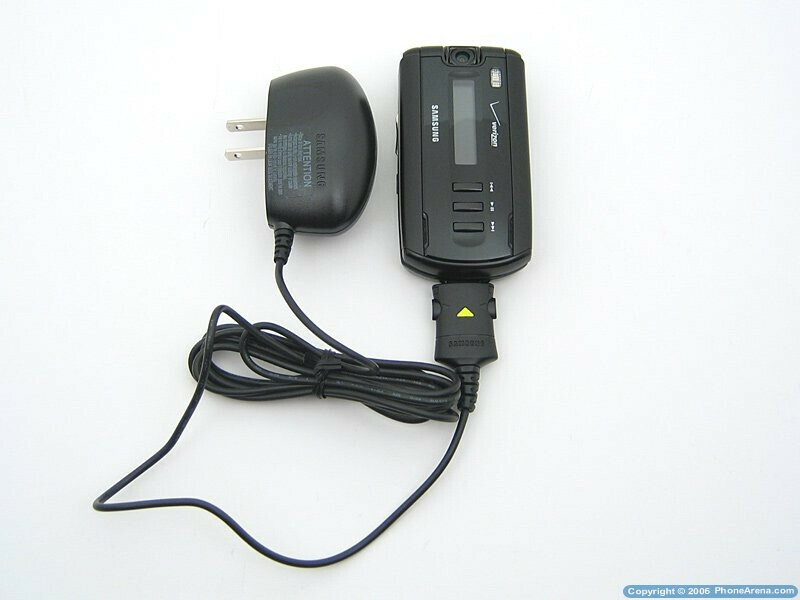 The Standard 1000mAh Battery gave us 3Hr of Talk Time or 6 days of Standby time. This is quite respectable, and an extended battery would only need to be purchased if you require more than 3Hr of talk time between charges. The A930 is reasonably priced and we were overall pleased with it as a mid-range phone. The quality is better than the lower-end A870, which should only be purchased is you need Analog service, but it falls short of its big brother, the A990. Call and Voice quality is good, Internal and External Displays work well, Camera quality is slightly above average, and the Music Player sounds good. Not to mention that you can use a Bluetooth Headset and there is a MicroSD slot for added memory. If you are willing to spend the extra money, the A990 will give you more features, including a higher quality QVGA display, 3.2MP CCD camera, and better voice quality. But if you can't make the jump in price, the A930 is still a good phone that is comparable to the LG VX8300. The 930 is a great phone. Got it in 2006, and have had no problems with it at all. I am trying to figure out how to replace it now with my New Every Two. 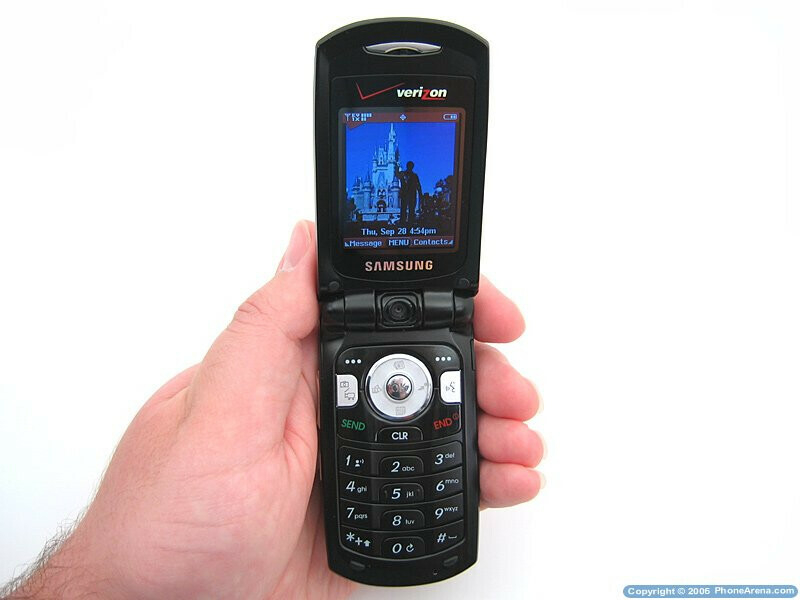 This phone had great audio quality on both ends, and was always reliable. Very good speaker also. Great job, Samsung.